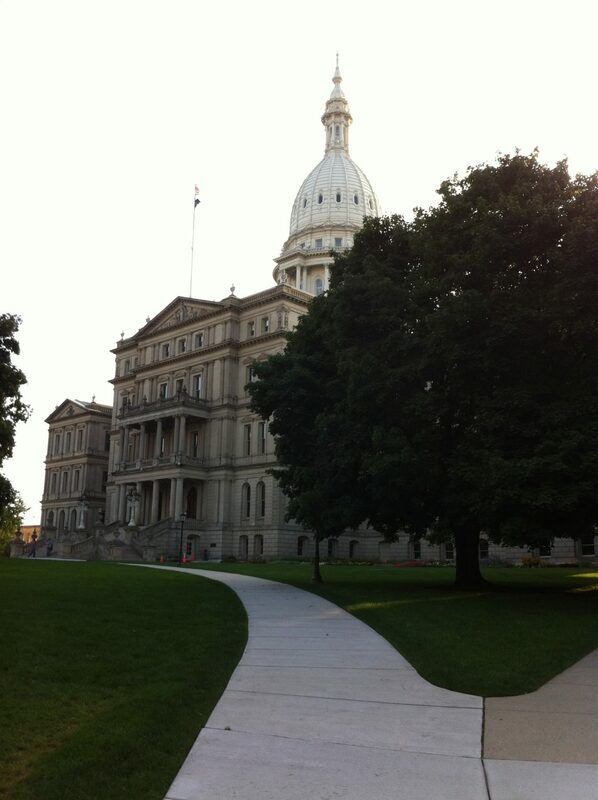 The Michigan state capitol just east of Washington Square. LANSING, Mich. – Inari Ramos strode down Capitol Avenue alone, a winter parka sheltering her from a brisk November gust. Feeling cold and isolated following the outcome of the Nov. 8 election, Ramos wore her emotion close to her heart; a two-toned shirt beneath her jacket expressly stated her disgust. The black lettering on Ramos’ T-shirt espoused the majority of Lansing’s voting population’s views. National voting trends proved that the urban-rural fissure had widened leading up to the presidential election, and Ramos felt that it was now on urban communities to stand up for themselves against what she consider encroaching conservatism. Ramos felt offended on several fronts by Trump’s rhetoric, and thought that the president-elect’s victory imperiled community relations. Lansing once again went heavily Democratic in 2016, with Democrat Hillary Clinton receiving 32,707 votes compared to 11,215 for Trump. Clinton’s nearly 3-to-1 ratio of victory within the city was comparable to President Barack Obama’s in 2012, when he received 33,661 votes. “I think it’s a more diverse population,” said Lansing City Clerk Chris Swope in explaining the city’s results. “And I think it’s people who are welcoming and comfortable to diverse cities, so I think that leads to a lot of people understanding that the Democratic Party allows more personal liberty to let other people live their lives the way they want to. To the east of Lansing, the cascade of blue votes continued. 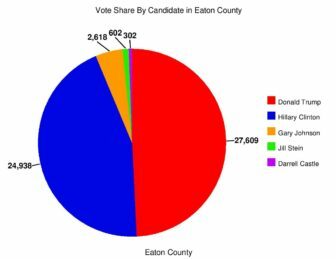 East Lansing voted for Clinton with overwhelming margins similar to Lansing; in 2016, Clinton gained 13,074 votes against 4,148 going to Trump. The college town tended even more Democratic than it did in 2012. “I think we’re such an anomaly because we have students,” Marie Wicks, East Lansing city clerk, said. Wicks said that as the location of a major university, East Lansing had an abnormally large Democratic base for a suburb. Extending slightly further to the east, Meridian Township displayed many of the same tendencies of East Lansing and was home to a similar demographic. 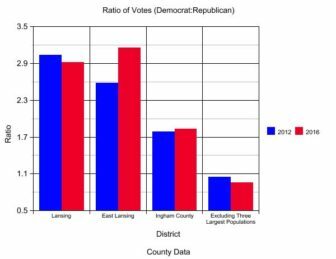 When removing East Lansing, Meridian Township and Lansing from the equation, however, the voting blocs swung the way of Trump. Of Ingham County’s remaining voting precincts, the Trump-Pence ticket received 22,020 votes to Clinton-Kaine’s 21,068. While that margin was tight, it was allegorical of Trump’s characteristic allure to lower-population districts. Just four years ago, Obama had taken the same area with a 22,445 to 21,397 vote lead. Furthermore, of six adjacent counties to Ingham County, five went predominantly Republican – the lone exception being Washtenaw County. Although both campaigns made frequent stops in Michigan, Trump personally visited Dimondale, a Lansing suburb in Eaton County, to deliver a speech in part about stirring the Michigan economy and increasing the automotive sector. 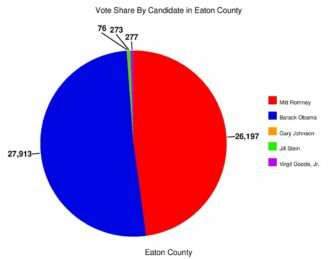 Trump turned Eaton County red on Election Day – a reversal of the 2012 election. While Ingham County remained heavily Democratic, it was apparent that the predilection radiated from Lansing and dwindled with increased distance. In surrounding areas, Trump was able to convert enough of those who had favored Obama to win the state, as was made official on Nov. 28. Yet, while Ramos saw her surroundings shift in favor of a candidate that she was averse to, she maintained some solace walking down Capitol Avenue. The city of Lansing was still blue. “Quite frankly, I just feel like Democratic is the better view. It’s more for the people instead of being strictly one-sided like Republicanism is,” Ramos said. Isaac is a senior with a dual degree in journalism and political science. Originally from New Orleans, he came to Michigan State University with a University Distinguished Scholarship. Since coming to East Lansing, Isaac has interned for WKAR, The Red Cedar Log, Fox 47, HOMTV and The Team 92.1. He also has published work for The Weather Channel, SB Nation, GiveMeSport, The State News, WDBM and newspapers across Michigan and has contributed in the writing, research and editing of two books.